Thank you for your interest in the trainings FHOP offers. FHOP's training activities build capacity for effective use of data for assessment, planning, policy development and program evaluation by government and non-profit agencies and community-based organizations. Activities include ongoing training for local, state, and non-profit agencies and hospitals, and developing web-based distance learning curricula for local and state health department staff. The traditional model of traveling for day-long face-to-face trainings has been challenged in such a large state in the face of limited budgets and time. New technologies have provided innovative ways to address these challenges, such as through teleconference software. 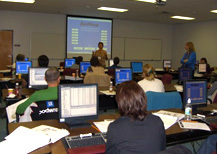 In 2010, FHOP began offering web-based trainings through live webinars. The webinars have been recorded and made available for viewing after the training.